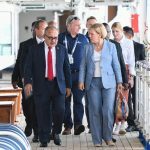 Carnival Australia Chairman Ann Sherry today met with PNG Prime Minister Peter O’Neill at APEC 2018 in Port Moresby to discuss cruise tourism in the region and its contribution to PNG’s economic growth.Ms Sherry and Mr O’Neill met on the sidelines of the high profile APEC CEO Summit, which is being hosted on board Pacific Explorer, one of three Carnival Australia ships chartered to provide accommodation for delegates and international media, and conferencing facilities. P&O Cruises’ Pacific Explorer and Pacific Jewel and Princess Cruises’ Sea Princess are currently berthed in Port Moresby Harbour for the duration of APEC. 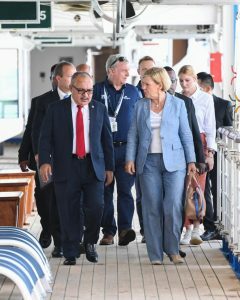 “Our ships have been sailing to the Pacific for more than 85 years and more recently our cruise lines have been pleased to play a major part in the resurgence of cruising to PNG,” Ms Sherry said. The PNG Government has acknowledged Carnival Australia’s part in enabling PNG to successfully host APEC 2018, which brings together national leaders, business representatives and other delegates from 21 Asia Pacific nations.